Hey all, I wanted to take a minute or two to introduce my sponsor Lauryn Otten from Geo Verseau. When Lauryn found my blog, I was more than excited, and happy to have her as a sponsor. Lauryn has beautiful jewelry that is definitely beautiful as well as unique! 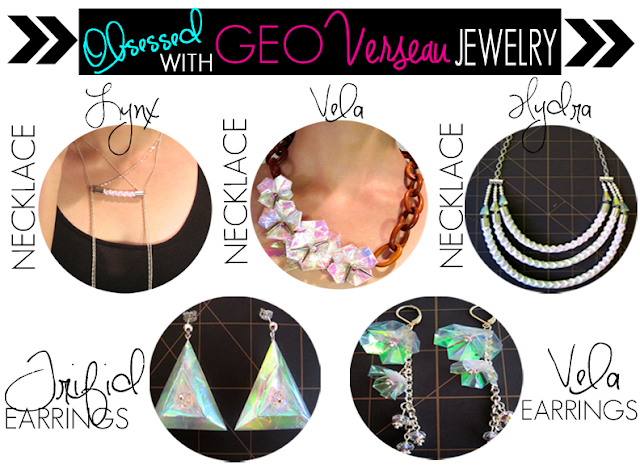 You could find her shop on Etsy: Geo Verseau or HERE. Lauryn has hand made origami jewelry which is named after a Nebula or Constellation. She keeps it simple by making beautiful pieces with paper, Crystal, metal, wood. I encourage my readers to check out her shop for innovative, affordable jewelry! Gorgeous jewelry! That Vela necklace is fierce!